Jesus Mary Joseph Sr. Sec. 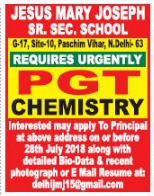 School, New Delhi has advertised in THE HINDUSTAN TIMES newspaper for recruitment of Teachers PGT jobs vacancies. Interested and eligible job aspirants are requested to apply on or before 28th July 2018. Check out further more details below. About School: The School is dedicated to the sacred memory of JESUS MARY JOSEPH. It is established under the aegis of Society of Jesus Mary Joseph, Sunder Vihar in New Delhi and commenced from 2007. The Supreme Head of the Society of Jesus Mary Joseph is Superior General, Rev. Sr. Theresia Supriyati. The JMJ School is recognized by the Government of Delhi and affiliated to the Central Board of Secondary Education, New Delhi. Beginning as a Co – Education Primary School and eventually upgraded to Senior Secondary School. New Delhi - 63, India.